Step 1: Find out how much nicotine is in your cigarettes. Step 2: Enter the nicotine amount below to determine your Return Pipe. This will also tell you about how many days it will take you to gradually wean off nicotine. How much nicotine is in your cigarette? Not all cigarettes are created equal. Some contain more nicotine than others. Depending on the type of cigarettes you smoke, it may take you longer to complete the Rien Pipe program. For this reason, If you smoke heavier cigarettes (anything over 0.1mg nicotine - you can check the nicotine amount on the side of the pack or refer to our convenient chart, How much nicotine is in my cigarette), keep your Rien Pipes instead of throwing them away. After finishing each pipe, wash it thoroughly with water and keep it in a safe place, preferable with the original package. We recommend keeping it in the original box for simplicity. That way, they are available when you are ready to complete the program. We've also written a short article on how to plan your quit day, in which we review the process of quitting and how to help make things even easier. The filter you should return under the Rien Pipe program to depends on the amount of nicotine contained in the tobacco being smoked. To determine your "Return Pipe" (and your cessation timeline), use the calculator below. How much nicotine is in your cigarettes? Following is a sample quit schedule based on a smoker whose cigarettes contain 0.1mg nicotine. 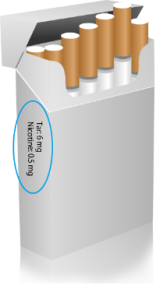 Given this nicotine volume, it would take about 31 days for their intake to reach 0.005mg - a minimal level considered as practically similar to being a non-smoker. At this point, many Rien Pipe users have said it is easier for them to quit entirely. Many Rien Pipe graduates have mentioned that by around Day 20-25, they feel less inclined to smoke. Prior to this point, some have noted the number of cigarettes they smoked per day actually increased somewhat before they grew tired of smoking and thought about quitting. For various reasons, not everyone is ready to quit smoking and transition to a smoke-free lifestyle right at the end of the Rien Pipe program (Day 31 in the above example). We recommend that if you find yourself in this situation, not to stress about it and instead continue cleaning and smoking with Pipe #31, which will ensure you are inhaling a minimal amount of nicotine while making lifestyle changes. Our Keep Pipe product is a 10-pack of Pipe #31 pipes and is intended for people who wish to keep smoking using Pipe #31 for a longer period.